Is Ocean’s 8 is worth paying for? 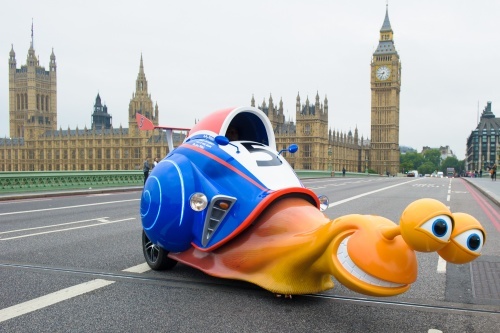 With Turbo speeding into UK cinemas in two weeks time on October 18th, Londoners and tourists alike were shocked today with a real-life Turbo speeding around the great city. Managing to easily beat his normal speed, according to the University of Exeter, of up to one meter per hour. Fast enough to have to be brought to a halt by our “brave boys in blue“! Hopefully he didn’t get a ticket for his speedy jaunt around the British capital but after watching the below clip I think I may have been wrong in that assumption. Don’t believe me? I thought you wouldn’t! So the nice people who let Turbo loose around the city managed to catch the whole event on tape as well as taking some photos for your pleasure. The real life Turbo started out like as an ordinary 1200cc BMW Superbike that was converted over a six month period into a trike and can easily double the UK’s speed limit with its 150mph top speed! I just don’t want to know where they were when they got him to that speed! 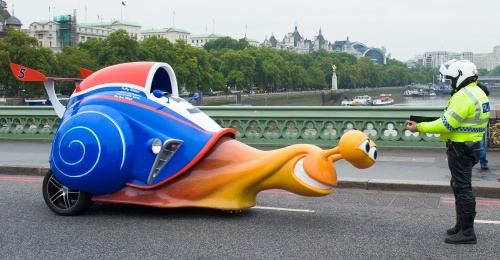 From the makers of MADAGASCAR and KUNG FU PANDA, TURBO is a high-velocity 3D family comedy about an ordinary snail who dares to dream big – and fast. After a freak accident miraculously gives him the power of super-speed, Turbo kicks his dreaming into overdrive and embarks on an extraordinary journey to achieve the seemingly impossible: racing against famed driver Guy Gagne. 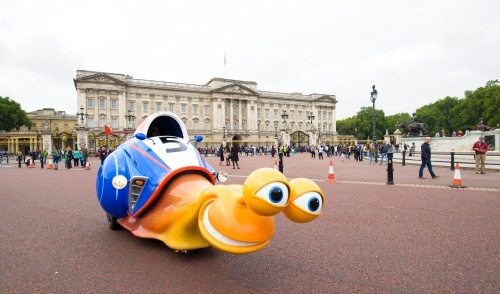 With the help of TURBO’s tricked-out streetwise snail crew, this ultimate underdog puts his heart and shell on the line to prove that no dream is too big, and no dreamer too small.